The NES Classic Mini has been a hot ticket this festive season, with demand far outstripping supply all over the world. If you're in the UK and still want to get one before Christmas, then you might want to keep your eye on the Official Nintendo UK store. More stock is promised in December according to the store, although no more details are given on exactly when that will be. It would be wise to expect stock to be pretty low, as well. 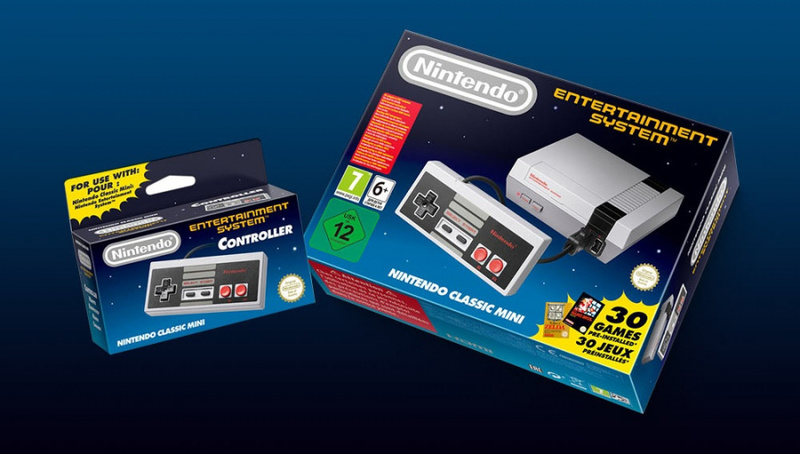 Elsewhere in the UK, there have been reports that the NES Mini is available at Tesco and Argos, which would suggest small shipments of units are getting through to retail. Have you been able to find one? Let us know by posting a comment. I'm still waiting on Zavvi to send out my NES Classic Mini that I pre ordered on the 14th July, the moment it was available to do so. Zavvi/The Hut, I don't think people realise, run the Nintendo UK store too. So all in all, it's been handled disgracefully by both of them. The UK Nintendo Store has said for 2 weeks now that they'd have more stock in December. I think everyone's given up by then. Sony has a great sale price on PlayStation 4 tho if anyone wants one. Jokes on you, Santa isn't real so their never coming back in stock! I actually expect gargantuan shipments to arrive soon. Being the "it" you for Christmas is huge. Artificial scarcity got Nintendo a lot of free media coverage with predictable stories about prices in the secondary market and shoppers brawling to get one of the ten that arrived at a retailer. When the shelves are stocked in the coming weeks, consumers will be primed to say "MUST BUY!" The fact that the OFFICIAL Nintendo store has to put out a statement saying that stock of their hottest item this holiday will be in stock before Christmas is a very poor state of affairs. It should be in stock EVERY DAY. Maybe not 1,000 every day, but their own store should be getting in a shipment every night or morning. Nintendo NY doesn't seem to get them in every day either, but at least the past couple of days they've been giving out wristbands. Nintneod is run by complete and total no doubt about it morons if that store isn't packed full of them the next 4 weeks starting tonight, it's next to probably 1 of the most visited sites in the world in December and they should have a wall full of them at all times. They are leaving so much money on the table. @UK-Nintendo what a segue... lets see if Sony tries that on for an Xmas ad. I await the controllers being restocked for VC usage but I have no problem waiting for the New Year as I won't be able to use it until then anyways. @rjejr There was other reporting on this, either by Kotaku or Polygon I can't recall, but while this is stupidity on Nintendo's part, no doubt, it's doubtful it's fake shortage, and actually Nintendo being sooo tight with their money in recent years, that they are afraid of seeing stockpiles of merch take up dust in warehouses that might not sell, "cough Wii U cough" (cough cough ET for Atari cough cough) and since that it's been one paranoid mess after another, and no one (well maybe now) has done much to fix it. The Switch is going to encounter this same EXACT issue. 2 million at launch.... Sheesh! @MrPuzzlez You should know by now that NES Mini is just a timely thing before the Switch launches. That's probably the reason of the short supply. @MrPuzzlez That's what worries me, if Nintendo can't keep on top of having enough stock of NES Minis and the Wii (at launch) then we could see history repeats itself with the Switch. In fact the options on a once full page is now down to one out of stock mini and one out of stock book. Gone are the bundles with the bag etc. @MadameSpuki Another thing that came to mind is the fact that the Switch could ACTUALLY be a knockout and the kept it in short supply until the holidays to keep people talking about it. I hope that they won't make it as disastrous as the NES Mini, and actually give a decent supply around the time of E3 2017. Because If they keep it TOO short of supply, the same group of developers that they have been getting mushy with could EASILY say, "Never again!" We regret to inform you, that the item in question is currently sold out. We unfortunately, have no announcements or updates at this time, as to when this item will come back in stock." So I'm not holding my breath for a December restock. And if I can't get one in time for Christmas, then I'll probably just pass on it. @SLIGEACH_EIRE I'm in the same position as you! I pre-ordered an extra controller from them and I am still waiting for it! I bet there is a warehouse full of these things somewhere! EBay's guarantee of $225 means if one ever does show up on a shelf in the US a scalper will grab it. With only 4 or so stores carrying them someone can buy up all the stock in a town in 20 mins. So I'm just going to give up trying.